The Thief’s Mentality is not concerned with actual acts of thievery, as much as it is the worldview of the deceptive and the delusional. If all theory is autobiography, the deceptive and delusional view the world from the perspective that the world around them is as dishonest as they are. Furthermore, those who don’t know acknowledge that they are either as dishonest as the rest of us, are in some form of denial or suffering from a psychosis of another stripe. They also believe those who instructed us to act right throughout our maturation (our parents and our teachers) have done this for so long that we’re now convinced that we are more honest than we truly are. The thief’s job, as they see it, is to open our eyes to the world around us to provide us a perspective we’ve never considered before. The Thief’s Umbrella. We’re no better than anyone else is, and we know it. Our parents pounded this principle home so often that many of us consider it our defining principle. If for any reason we forget that, in our interactions with deceptive people, they remind us of it. They’ll put so much effort into it that by the time they’re done with us, we might end up questioning our integrity. Most of us have had a lover cheat on us, but how many of us have had one cheat so often that we’re still embarrassed by how much they fooled us. Their octopus ink involved psychological projection in the form of repetitive accusations of infidelity on our part. Those of who have never cheated on a lover know how effective such charges are, for they keep us on defense. We’ve all encountered deceptive individuals who employed these tactics so often that we never considered questioning their integrity. If their goals were to prevent us from analyzing them, they were successful, but when we reflect back of those confusing entanglements, we recognize that their accusations said more about them than us. Some might call it projection, others might say that it’s some sort of deflection or obfuscation on the part of the thief, but The Thief’s Mentality suggests that it all falls under a comprehensive, multi-tiered umbrella called the thief’s mentality. Delusions and Illusions. While some of the characters in these stories may be engaged in one of the various forms of deception, most of them (actual thieves, liars and cheats excepted) are not lying in the manner we traditionally associate with a dishonest person. They believe what they are saying to be true, but the difference between them and most people is how they rationalize what they do. Some of us consider the ramifications of what we are about to do, others just act, and leave it to us to reflect on what they did. Whether we’re the odd ones or not, their worldview is so foreign to ours, we dig deep to understand how, or why, they think so different. It might be a fool’s errand to try to source such a line of thought, but if we were able to meet their parents, and various other members from their genealogical tree we might discover the seeds of it. For those who consider this a bit of a stretch, The Thief’s Mentality asks how much of our lives do we spend rebelling against, and acquiescing to parental influence, and how many of us can say we are entirely free from it? The Stories of Others. “You have to tell your own story simultaneously as you hear and respond to the stories of others,” by Elizabeth Alexander. This quote captures the essence of The Thief’s Mentality. The essays contained in this collection were not spontaneous creations. Rather, they are deep methodical dives into the motives of everyday people involved in everyday interactions. These are their stories, and it was the author’s job to capture them. Some of their stories might be similar to ours, but most of them provide a contradictory view of the world that is so different from ours. We learn through our reading that it’s all a big, tasty stew. The Sitcom Formula. My favorite sitcoms involve the formula of a normal main character playing the eye of the storm. The ensemble cast members define the show and the main character, through contrast, but the central role the main character plays on the show is that of an observer. (Think Jerry Seinfeld on Seinfeld or Alex Reiger on Taxi.) The main character is so normal that they act as the conduit to the everyman in the audience, pointing out the flaws, foibles, and eccentricities of the side characters. “Wouldn’t your life be so much easier if you just did that this way?” is the main character’s response to the ensembles’ thoughts and actions. Our side characters in life often define us in similar ways, as they add unnecessary complications to their lives, and we play the center to their storm. We found the “Wouldn’t your life be so much easier if you just did that this way?” questions a more engaging way of framing an argument in these stories. This isn’t to say that The Thief’s Mentality avoids arguments. In the most opinionated pieces in this collection, we present the “I” character’s opinion in conjunction with how the opposing view may have formulated. We do disagree with the manner in which they conduct themselves, but we catalog the probable gestation cycle of the begrudged, and the role we all played in it, but we “but” our way to achieving the final question regarding their nature. A POS. Do you know a true piece of work (a POS)? Have you ever met his parents? Yeah, nuff said, right? Chances are his parent’s friends were all POSs too, and so were their kids. Chances are our friend spent most of his youth running around with those kids. Without knowing it, he developed an affinity for likeminded people, until everyone he knew thought the same way and developed in a similar manner, until Ms. Comparative-Analysis came walking down the hall. By the time he encountered her, he knew how to use his “She ain’t all that” to combat uncomfortable comparisons. As he learned more about her, he added a splash of “Who does she think she is anyway?” to fortify his wall. If he eventually befriended her, most of his preconceived notions fell apart, but he wasn’t discouraged. He attempted to convince her that she was a POS too, and she didn’t even know it. He aided her enlightenment with a constant barrage of accusations, and he continued this onslaught to keep her as honest as he wanted her to be. His rationale was that he didn’t want her to do to him what he was more apt to do to her. Even if some part of him knew she never would, he did his best to keep her insecure and unsure of her moral integrity, so she didn’t flirt with the notion that she might be better than he is. He also did this because a part of him knew that if people wanted to keep him honest they would consider using such tactics against him. He also knows that the best defense is a good offense and a constant barrage of accusations will keep her on defense, so that she might never examine him and see his true POS nature for what it is. Listening skills. “You’re a great listener,” a casual associate once told me. “In a world of people waiting for others to stop talking so they can speak, you actually listen to what people say, and you pay attention to what they do. I just want you to know how rare that is.” I beamed with pride. I didn’t beam as much when others issued similar compliments, because by that time I happened upon a secret that might diminish their compliments: I didn’t actually care what happened to the people telling me their stories. I listened to their stories so well that I could repeat them with a surprising level of accuracy, and the questions I asked them throughout revealed how fascinated I was with their story, but I may have cared less about what actually happened to them than those who don’t listen. This little secret left me wondering if they would still give me the compliment if I revealed that fact to them. Would they smile in the appreciative way they did if they knew my motives were less than pure and some might say self-serving? Others didn’t offer me that compliment in such a direct manner, but they opened up and told me things about their life I can only guess they didn’t dare tell anyone else. This indirect compliment expanded when I asked them active listening questions, and they answered every question I had. The intimacy we shared during those moments told me how rare it was for them to have a person so interested in what they had to say. The easy answer I developed for my dilemma was that I love a great story, and when I hear one, I want to know every single detail of it. I want to explore it beyond the storyteller’s frame, to the extent that the storyteller is examining the short-term and long-term effects of their story in a way that the storyteller may not have considered before. No matter how urgent I became, however, I didn’t care about them. I just wanted to know everything about their story. The final answer I arrived at was as confusing as the question, for the primary reason most people don’t listen to others is that they’re too self-involved. Yet, I was so self-involved that I was more interested in the stories of others than most are. When I listened to another tell their story, it was almost entirely self-serving, as I strove to know them better than they might know themselves, so that I might understand myself better through all the similarities and contrasts they present in their story. Did I deserve the title of being called a great listener if my motives were not pure, or was the “who cares why you’re listening as long as you are” concept more prominent? I still don’t know the answer to that question, but I do know that in some ways their stories helped shape my story in a way that shaped this collection of essays. Rocking the Worldview. When we listen to others tell their tale, we develop an idea for how the world works one person at a time. Similar to the manner in which the universe works, we believe that all earthly bodies have a magnetic relationship to one another that defines their orbit, our orbit, and the general sense of order in our universe. When an exception to our rules comes along and redefines it, they do so at their own peril. We don’t allow them to breathe after they hit our tripwire. We rip them apart and help them put all their pieces back together according to our sense of order. Some might argue that that is the essence of The Thief’s Mentality, but this book focuses its theme on those people who tweak the premise of our sense of order. The Epiphany Effect. The Thief’s Mentality is loaded with epiphanies. A reader could make the mistake in assuming that the reason we wrote the essays in question was to provide the author a vehicle to write all the epiphanies he learned over the years. While that’s not entirely true, we do find the epiphanies so compelling that there is some grain of truth to it, but what is an epiphany? Even though there is a dictionary definition of the word epiphany, it is a unique word in the lexicon for most define it based on their individual experiences with it. The potential power an epiphany might have on a person’s life is characteristically patient for the immediate reaction we have to these thoughts is that they’re so obvious that we think either we have explored them before or we should have. A revolutionary thought, by contrast, has an almost immediate impact. A revolutionary thought causes our jaw to drop, but an epiphany typically requires subsequent incidents for the recipient to understand how they apply to our lives. When this occurs, the recipient begins to see what they considered an accepted norm in a way slightly different than they did before they heard the thought. For some the word has religious connotations, for others it might involve striking moment, but some consider it nothing more than a subtle crank of the wheel. 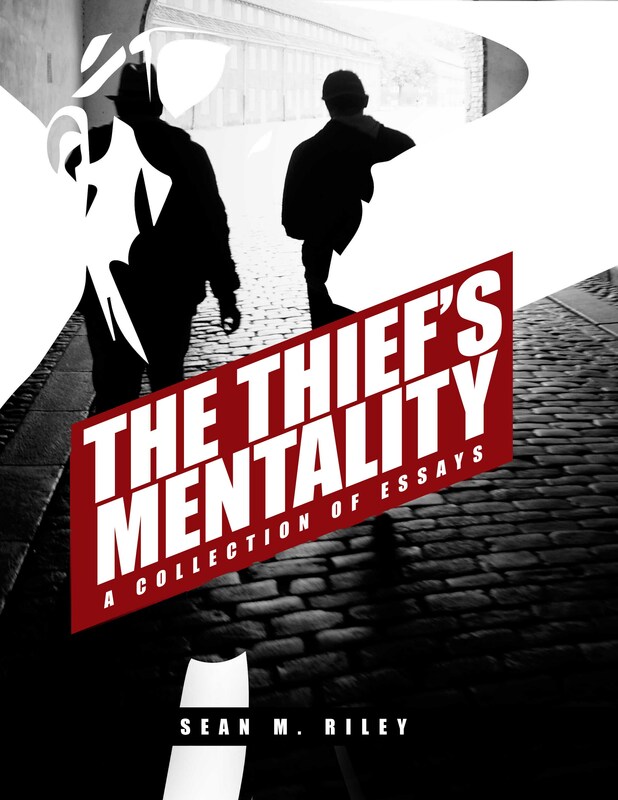 One noteworthy experience discussed in The Thief’s Mentality, involved an obvious thought the author spent far too much time tweaking. When he first heard it, he dismissed it as so obvious that he didn’t think about it for ten seconds. The characteristics of this epiphany reared its beautiful head later, when the author least expected it, and it continued to do so until he had it all shiny, redefined, and ready for use in his world. This definition of an epiphany is similar to a subtle twist in a movie that does not reveal itself until the movie is over. “Why did that happen?” we ask our friends on our way out of the theater. “Because she said that to him? Oh, before she did the other thing. Ok, now it all makes sense.” When we begin to notice how often these subtle, otherwise insignificant thoughts apply to our situations we start chewing on it, until we’re digesting it, and we’re viewing the world a little bit differently than we did before we began processing the thought. Others might continue to find such tiny nuggets of information nothing more than waste matter –to bring this analogy to its biological conclusion– but when an eager student begins adding bits of their own thoughts to an epiphany, it snowballs into an individual truth. Once we clear these hurdles and embrace the power of epiphanies, we begin to see what we once considered the accepted truth, as it is for so many, is not as true for us as we once thought. The Thief’s Mentality plants no flag on whatever unusual points of brilliance these epiphanies unearth for the reader, for the author is but a messenger repeating what should’ve been so obvious prior to processing it. These epiphanies provided eye-opening clarification on a topic we thought we understood, but the epiphany can provide a subtle crank of the wheel that we call the epiphany effect. As I wrote, the epiphany effect can lead the recipient to think they should’ve considered it before, even to the point of considering themselves less than intelligent in the aftermath. “I can’t believe I never saw it quite that way before.” Epiphanies can do that, but the individual who might consider themselves less than intelligent for not seeing it sooner should relax with the knowledge that this happens all the time to such a wide range of people. One final note on epiphanies, they are elusive and fleeting. As author James Joyce once said, “[They] are the most delicate and evanescent of moments.” An epiphany is not a one size fits all, as most of them do not apply to most people. The delicate nature of an epiphany is such that even when they do apply they are so personal that no one else might understand why it means more than the obvious to us. Locating the qualities of an eye-opening thought and interpreting it for personal usage does not require a level of intelligence, as I wrote, but it does require some level of personal ingenuity to sculpt and shape them for individual interpretation. The fleeting nature of an epiphany suggests that it’s entirely possible that a person could stumble across an epiphany and miss it. Most naked epiphanies, or those that we haven’t shaped for personal interpretation, seem so obvious that we allow them to pass without further thought. By the time we recognize the substantive information of an epiphany, we may not remember the loose, delicate connection it could have had to our lives and the manner in which we could’ve applied it. The author has encountered many situations in which an epiphany could’ve applied, but he couldn’t remember the exact phrasing of the epiphany. How many times do we hear such a subtle crank of the wheel, and when we try to use it, we narrow it down to the author that wrote it, and the book they wrote it in, but we can’t find the exact passage in question when we need it. It’s frustrating. Some might say that if the epiphany were as profound as we suggest, we would’ve remembered it, and while that may be true in some cases, in others, it elucidates how elusive and fleeting they are by nature. As the Joyce quote alludes, the nature of their power requires diligence on the part of the recipient. The Thief’s Mentality is comprised of what some might consider so obvious that they’re hardly worth considering, but it’s these little, insignificant thoughts that end up shaping our thoughts more than the revolutionary ones might.